← This Sunday is Setsubun – What is Setsubun? It is cold in Yokosuka! Personally I think February is the coldest season in a year! I would like to explain heating system in Japan. These days, because of the high price of oil and the relative airtightness of apartments in Japan, people prefer electric heating, such as air conditioners, oil heaters, ceramic heaters and floor heating. 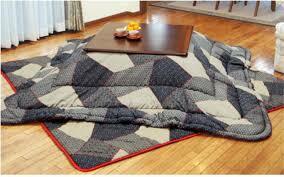 In addition to these general home-heating systems, people use such appliances as electric carpets and kotatsu for localized heating. As part of efforts to help protect the environment, 66 percent of Japanese citizens try to save electricity.